I’ve got to admit I was so nervous before attempting this hand painted cake. I’ve painted smaller aspects of cakes before but never anything on this scale. I knew if I messed up I would ruin the whole cake so the pressure was on. When starting the cake I had to really think about how I was going to use the colours on the roses and what should come first. The main detailing was in the darker pinks & red so starting with the paler pink background detail was key to getting the design right. Once the style of the flowers took shape the cake had to be set aside to dry a little, not completely as I wanted that watercolour effect but if I’d had started too soon the colours would have just merged and the detail lost. Again I had to allow the colours to dry before I finalised the cake with the darker details. 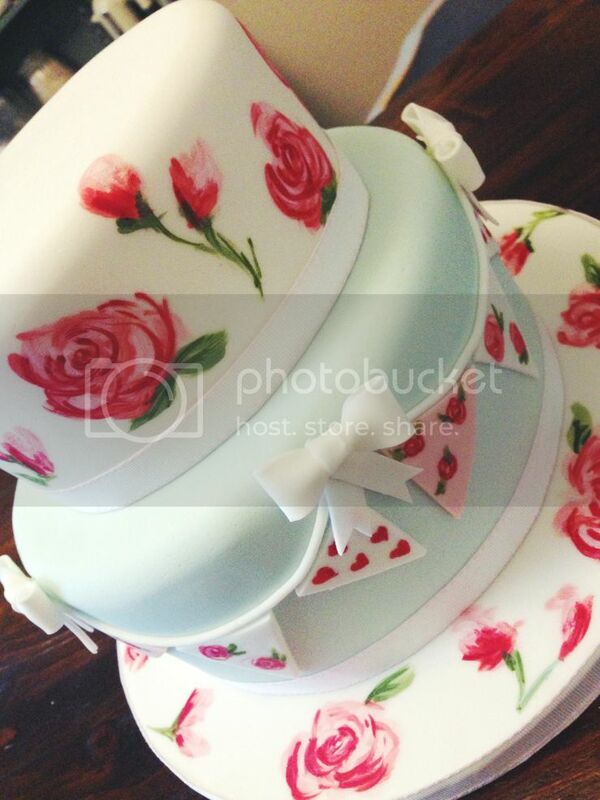 I absolutely love this cake, it’s so pretty and such a different effect. I can’t wait to create my next hand painted cake. What do you think? Do you like the handpainted look or prefer something more traditional? If you love this cake pop over and take a look at my other cakes. That is utterly beautiful. You are a very very clever person! I would love to be able to do that! This is absolutely stunning. So artistic it looks almost too good to eat. Really well done, you should be super proud of yourself!